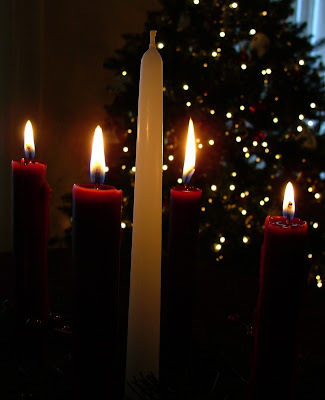 The four Advent candles represent Hope, Peace, Love, and Joy and by this week they all blend together in the magnificent message proclaiming God's incarnation. Three years ago while on a missions trip to India we had the privilege to visit an art gallery in the city of Agra which is also the home to the Taj Mahal. The gallery housed numerous silk tapestries created by a very highly honoured artist named Shams. 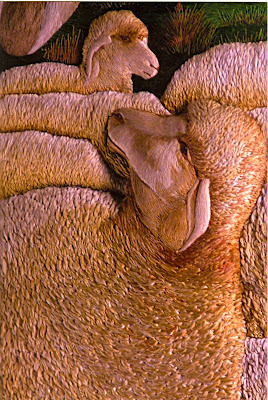 Shams was the originator of this very unique art of embroidery in three dimensions. In the darkened gallery, each tapestry was unveiled and highlighted with lights for our viewing. The following tapestry was absolutely heart stopping as in silence we marveled at the intricacies of this 8 x 6 foot work of art that took Shams 6570 days to create. 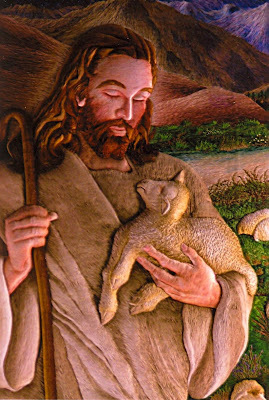 In this Advent season I have been impacted by the message of God's little lamb born in Bethlehem, who became the Good Shepherd, who again became the lamb that was slain so that through his incarnation we could come to personally know God who is not distant, but Emmanuel, God with us.
" He tends his flock like a shepherd. he gently leads those that have young." 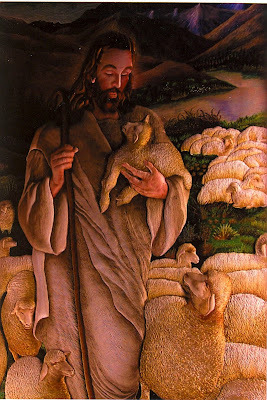 " I am the good shepherd. ... I know my sheep and they know me. may have life and have it to the full." My heart is glad - full of Hope, Peace, Love and Joy. and glory and honor and praise." I remember that beautiful tapestry. Tears pored down my face as I realized the truth of the of the whole story behind it. Praise God!